This topic contains 19 replies, has 11 voices, and was last updated by dinhphuong569 1 month, 4 weeks ago. So you see, different brands show disparities in battery performance. Feel free to share your thoughts in this post. The camera will not turn on when using the above batteries. Thanks for sharing in the community. Since these batteries are the correct voltage, their reason for not working sounds more like a terminal contact issue. You might want to check that out. I bought enough batteries to power two cameras. All batteries were fine and showed ok in the charger. Neither of the two cameras worked with them and did work with the original batteries. I was able to power one of the cameras on with the old batteries for a few seconds (as they were as good as empty), so the connections were fine. Support is also aware that they dont work and I told them to update the battery FAQ and they keep agreeing, but I still don’t see it changed on the page with a list of incompatible batteries. If there are known batteries that comply with the requirements but don’t work, they should be mentioned on the page as not compatible. Not everyone looks on the forum. It makes no sense that the batteries would not work, if they have the correct voltage. I still say it’s the battery connections that is the problem. And what I mean by that is the physical battery top and bottom, may not stick out enough to make contact in the camera. If the battery size is not correct or does not make adequate terminal contact. What is the safest material to use to bridge the gap and allow contact with battery and terminal? The flashlight community often uses small neodymium magnet discs to extend the positive button contact. I suspect those who are having contact issues simply need a longer positive button for the battery to allow it to reach the camera contact. However, given the very tight fit I’ve observed for my Argus (I’m using Evershines designed for the Arlo camera), a magnet may not stay put or could even be too thick (1 mm seems to be the thinnest you can get). Aluminum foil can also work, just be careful it doesn’t short anything out. As was already mentioned, any RCR123A should otherwise work as long as it’s not too long, in good health and charged (fully charged voltage should be 4.2V under no load). 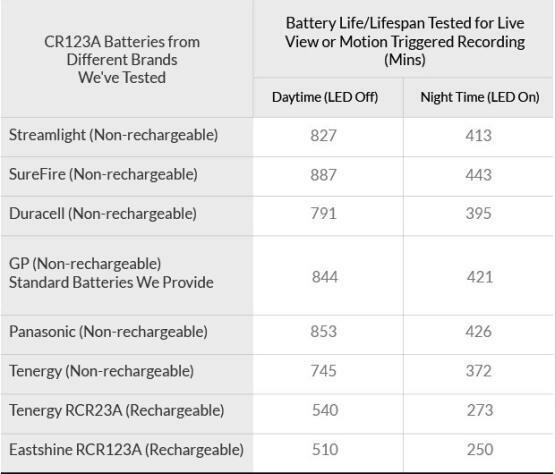 I suggest you buy RCR123As that will work in the Netgear Arlo camera (this ensures they won’t be too long), and stay away from cheap Li-ion batteries! Note that many protected RCR123As sold for flashlights may be too long. I’ve found one respected brand of RCR123A (16340) commonly used in flashlights that is way too long to fit the battery slot (Efest protected button top), and several others that (based on the specified measurements) are similar in length. 35 mm seems to be the rough limit, but you often can’t trust a sellers dimension specs to be very accurate. Based on my first set of discharged RCR123As, unprotected 16340s may be ok to use (since none of the protection circuits was tripped after the camera shut down) and most of those should fit just fine (the protection circuit adds length to the battery, but prevents over-discharge which can reduce the it’s cycle life). These seem to perform fairly well, but (based on my experience so far) at room temperature, they will be flat dead within 12 hours or so of receiving the low battery warning (that’s with one or two camera activations). They have a protection circuit which did not appear to be tripped, which suggests to me that the camera may not be capable of over-discharging a 16340 battery. So, as long as you’re using a QUALITY charger (check out HKJ’s Li-ion charger reviews: http://lygte-info.dk/info/roundCellChargerIndex%20UK.html), you may not really HAVE to use protected 16340s, which would open up quite a lot of high quality 16340 options. Mountain Electronics is a reputable place to shop for unprotected cells (the protected 16340s they sell will NOT fit (17360 or 17370 would probably be accurate for those), so don’t bother. A little extra diameter (17 vs 16 mm) doesn’t cause any problems in the Argus. I’ve always used tin foil, fold a small amount up, stick it in to fill the gap. Easy and cheap. Wondering if 18650 (3.7v) batteries would work in the Reolink Argus? We are sorry that the 18650 battery does not fit the battery slot. Please refer to our test report of batteries. I have seen that difference in height [ does not make adequate terminal contact ] on rechargeable batteries, specially if ordered on ebay. A good way to check, slide a small piece or aluminum foil ( folded up ) in between the negative end of the batter and contact. Make sure that it ends up being a snug fit. Also, insure the cam’s contacts are free and clear. Use a small amount of alcohol on q-tip and clean the contacts. 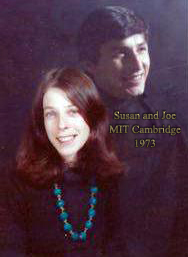 Joe, over 70 years on the planet and never ceased to be amazed..
Oh but I was so much older then, I'm younger than that now. Oh I was so much older then, I'm younger than that now. Anyone try the RavPower batteries advertised on Amazon.ca site? I am extremely disappointed at how often I have to recharge my batteries. I get between 20 days and 40 days with an average over the 4 cameras of around 30 days. I track my battery charges with a spreadsheet. The cameras are activated for detection for approximately 45 to 60 minutes once per day. I do not spend any time live viewing.